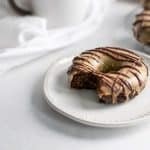 Grain-Free Chocolate Donuts are the perfect paleo-friendly treat. Made with coconut flour and sweetened with maple syrup plus topped with an espresso glaze for the mocha lovers. Preheat oven to 375º F. I recommend a silicone donut pan here. No spray needed if using silicone. Sift cocoa powder and coconut flour into medium bowl – you can also whisk together but sifting removes most lumps. Whisk in tapioca flour, baking soda, baking powder and salt; set aside. In a small bowl combine milk with apple cider vinegar; set aside. In large bowl using whisk or electric mixer, combine nut/seed butter with oil and maple syrup. Add in eggs one at a time until combined. Add bowl of dry ingredients mixing until almost smooth, then gently add in milk-vinegar mixture. Batter should feel kind of like thick, wet cake batter. Evenly distribute donut batter into 6 donut cavities – in my donut pan I left about 1/4″ room from center top. If you’d like to fill 8-9 cavities your donuts won’t be as thick and less baking time may be required. Bake donuts for 10-12 minutes, or until inserted toothpick comes out clean. Allow donuts to cool in pan for a few minutes before gently transferring to cooling rack. Allow donuts to cool completely before glazing. Make the glaze: in a medium bowl (shallow enough for dipping) combine coffee creamer with espresso powder until dissolved. Add in powdered sugar and stir until no lumps are present. For the chocolate drizzle: melt chocolate chips and coconut oil in 15 second increments, stirring in between until melted. Dip donuts into espresso coffee glaze and place back on cooling rack. TIP: I dipped the “bottom side” of the donuts because that was the smoother side of the donut. Once glaze has set (about 5-10 minutes) drizzle with melted chocolate if desired. *You can also use 2 TBS cold brew coffee. I did not test other flours here so I can’t recommend any good subs.